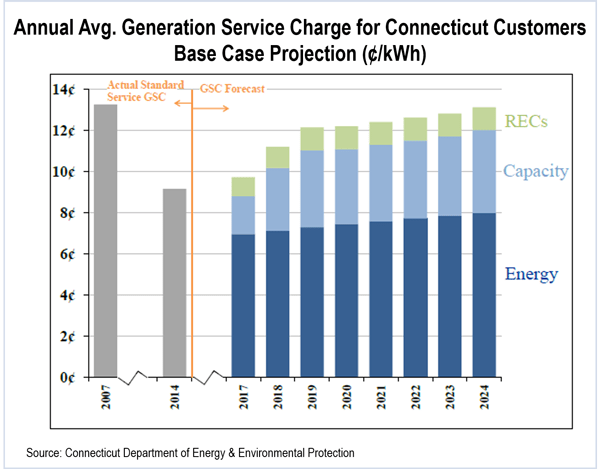 Connecticut policymakers say inadequate natural gas infrastructure will lead to sharply higher electricity prices despite energy-efficiency measures that will nearly eliminate demand growth over the next decade. The state’s 2014 Integrated Resource Plan, released last week by the Department of Energy and Environmental Protection, sees the state mirroring regional trends: an increased reliance on natural gas generation hampered by a constrained pipeline system, and shortfalls of capacity and renewable energy sources. Increased prices for natural gas, capacity and renewable resources are likely to increase the generation rates for retail customers by 63%, from approximately 9.8 cents/kWh in 2014 to 16.0 cents/kWh in 2024. “Connecticut ratepayers are being affected by critical developments in New England’s wholesale electricity markets that are challenging the affordability and reliability of the region’s electric system,” the plan says. Demand growth is expected to be flat over the next decade due to the increased use of energy efficiency. Electricity consumption is only expected to grow by 0.05% annually, with peak demand growth at 0.5% annually. The state’s last IRP, in 2012, had projected an increase in consumption of approximately 1% per year. New England’s capacity surplus will disappear by 2017, when a shortage of 143 MW is projected, primarily due to the announced retirement of 4,100 MW of non-gas generation. Capacity costs are likely to increase to about 4.9 cents/kWh by 2024, when the region will need an additional 1,700 MW in resources. The region now depends on natural gas for more than half of its power generation, a situation that will be exacerbated by planned coal plant retirements and a shortage of pipeline capacity to deliver gas to both power plants and winter heating. “This problem is too big for any one state to solve alone, and all New England states should contribute to a solution,” the IRP says. Regional pipelines are seen as a potential solution, but local opposition that was especially loud in Massachusetts has put some initiatives on hold. The wholesale spot market price of natural gas delivered to New England has spiked from about $1-3/MMBtu before 2012-13 to $8/MMBtu in 2012-13 and almost $14/MMBtu in 2013/14, adding $3 billion to wholesale electricity prices. Gas pipeline capacity expansions expected to enter service in November 2016 as part of Connecticut’s Natural Gas Expansion Plan may provide only temporary relief, the plan says. Competition between Connecticut and other states for a limited supply of new renewable resources will likely add 0.3 cents/kWh to retail rates by 2024. The impact would be larger but for long-term contracts signed with large wind, solar and biomass facilities, which will save ratepayers more than $235 million over the next two decades. These programs, including a solar incentive program and utility-owned renewables, will only provide about 2,400 GWh of renewable energy by 2020, or about 40% of Connecticut’s renewable portfolio standards goal of 20% by 2020. The plan calls for increased support for distributed generation to address the renewable shortfall. The plan proposes using existing state authority to solicit large-scale hydropower to offset some natural gas generation, or seeking new authority from the legislature to run a competitive procurement process for liquefied natural gas (LNG) and gas pipeline capacity. The IRP notes a marked decrease in emissions since 2007, with NOx, SO2 and CO2 down 71%, 95% and 28%, respectively. But it said emissions will increase slightly as gas infrastructure constraints cause an increase in generation from the state’s remaining coal-fired capacity. The plan also proposes “reviving and improving” state demand response programs if the D.C. Circuit Court of Appeals decision voiding federal jurisdiction over DR is not overturned by the Supreme Court. Connecticut regulators issued the state's 10-year integrated resource plan last week, warning of natural gas pipeline constraints and stiffer competition for renewable resources. Increased use of renewable energy will depress energy prices, increase capacity prices and lead to early retirement of some baseload plants, according to a discussion paper by ISO-NE. Prices dropped more than $22/MWh to $41, according to the 2015 Annual Markets Report by the Internal Market Monitor of ISO-NE.